The Wrendale Designs Dog Pen is the perfect writing accessory to go with your Wrendale Designs stationery. The pen is perfect for quickly jotting down ideas and scribbling important notes and making lists. 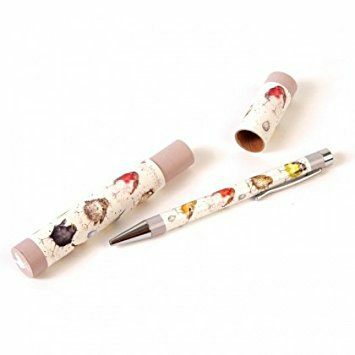 The pens is illustrated with popular dog breeds. The Country Set Garden Birds Pens. The perfect writing accessory to go with your Wrendale Designs stationery. The pen is perfect for quickly jotting down ideas and scribbling important notes and making lists. The pens is illustrated with popular garden birds. The Country Set Hare Pen. The perfect writing accessory to go with your Wrendale Designs stationery. The pen is perfect for quickly jotting down ideas and scribbling important notes and making lists. The pens is illustrated with Hares. Perfect for anyone who loves and enjoys the British Countryside and wildlife.